alternating red and yellow bands spaced every 12 inches the entire length of the pole. Weighs less than five pounds. Lightweight and non-conductive, made with high-strength dielectric fiberglass with Epoxy Resin coating. Poles feature positive locking, spring-loaded buttons for fast and easy extension. Resistant to conduction of electricity. Yellow bands are the native color of the dielectric fiberglass. Red bands are UV-resistant exterior grade vinyl with solvent based water-proof adhesive. Color combination is specifically designed for high contrast in extreme lighting conditions. 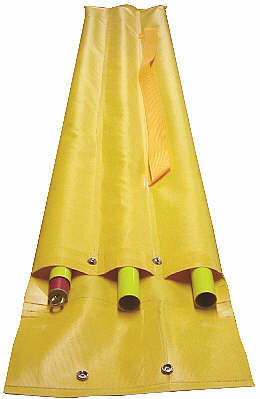 Tip section is equipped with a brass eyelet for attaching ribbon, flag, or Mini Flasher™ strobe light (model 2130). Base is fitted with a 5/8-inch x 11 thread with a standard steel point. Made of dielectric fiberglass, raw poles are rated resistant electical flow to 100kV rms. Finished poles with point, eyelet and stripes are not tested. 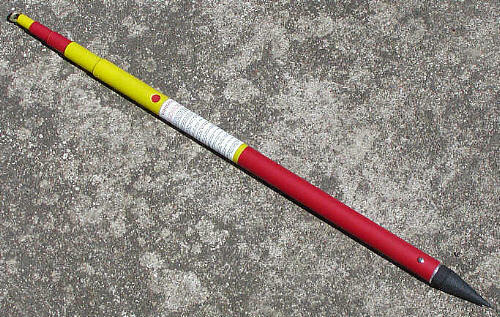 Similar Metric Range Pole (2111M) available by special order. Email for further information. Like the 2111 but shorter and compact, 29-inches collapsed. Weighs less than two pounds. alternating red and yellow bands spaced every 12 inches the length of each 1¼-inch pole section. Each 4-foot interchangeable section snaps together with a button lock. 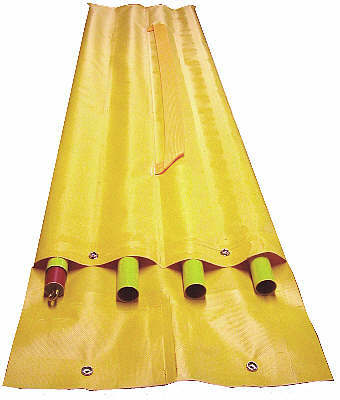 Available in sets 8, 12 or 16-feet in length. Set storage cases available. Each set weighs less than five pounds. Lightweight and non-conductive, made with high-strength dielectric fiberglass with Epoxy Resin coating. Poles feature positive locking, spring-loaded buttons for fast and easy extension. Resistant to conduction of electricity. Eyelet Tip piece is equipped with a brass eyelet for attaching ribbon, flag, or Mini Flasher™ strobe light (model 2130). Made of dielectric fiberglass, raw pole segments are designed to resistant electical flow to 100kV rms. Finished poles with point, eyelet and stripes are not tested. 8 ft 3 lbs 54 inches each 1-foot 2 RPS-08 195. 12 ft 4.4 lbs 54 inches each 1-foot 3 RPS-12 272. 16 ft 5.8 lbs 54 inches each 1-foot 4 RPS-16 349. 4 ft 1.4 lbs 54 inches 1-foot Section (only) SEG-RPS 78. 4 ft 1.5 lbs 54 inches 1-foot Base Section (only) BASE-RPS 86. 12 inches 0.5 lbs - - Eyelet Tip (only) TIP-RPS 24. 6 inches 0.5 lbs - - Universal Mount Tip (only) UNIV-RPS 75. 6 inches 0.5 lbs - - 5/8x11 GPS Mount Tip (only) GPS-RPS 60. 4 inches 0.5 lbs - - Steel Point (only) 5190-00 12. All fiberglass sections are designed to meet OSHA, ASTM F-711, IEC-855 & IEC-1235. SB8 PVC Extra Bracket (8 5/8-inch) 11 .